Wallace in 2012 - Brown and Sanders to be the Next WR's to Hold Out? Wallace in 2012 – Brown and Sanders to be the Next WR’s to Hold Out? The spring holdout of Mike Wallace could be nothing compared to the potential absences at wide receiver a year from now when both Antonio Brown and Emmanuel Sanders find themselves in the same situation as restricted free agents. Wallace may be paving the way for the duo in his struggles to negotiate a long-term contract with the Steelers above the $2.74 million one-year contract tender he has declined to sign. Indeed, Brown said he is taking notes and learning from Wallace’s actions, and he has come to a conclusion. “Whatever the case may be, I plan on being here,” Brown said Thursday as the Steelers hit the halfway point of their spring practices with two more weeks to go. 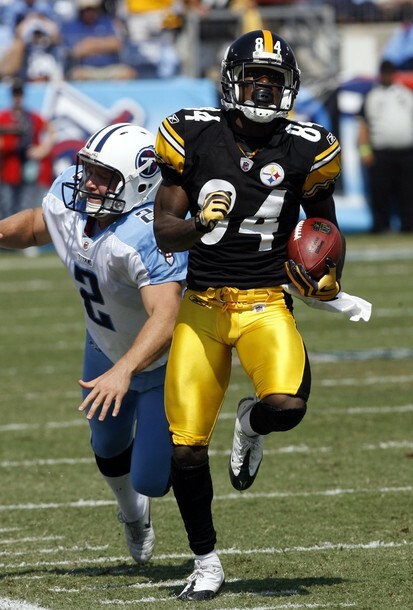 Sanders was projected to be the better of the two by virtue of his third-round selection by the Steelers in ’10. He had a more productive rookie season than Brown with 28 receptions (16 for Brown) for 376 yards (167). Injuries, though, cut deeply into Sanders’ playing time last season, starting with surgeries on both feet more than a year ago. Another foot surgery was needed in training camp, and then knee surgery followed during the season. “Having a great start in the National Football League on the right foot and having a great season and then coming back and having the injury bug my sophomore year was definitely frustrating,” Sanders said. 5 Comments on "Wallace in 2012 – Brown and Sanders to be the Next WR’s to Hold Out?" I also think I read this on BR…(an interesting site for steelers news, yet a little too wishful thinking for my taste).